Intel has just released its final 2016 financial statements for the full year and Q4 2016. Things look pretty good for Intel within these financial snapshots, as it reports record revenue for both the FY2016 and Q4 2016 periods. 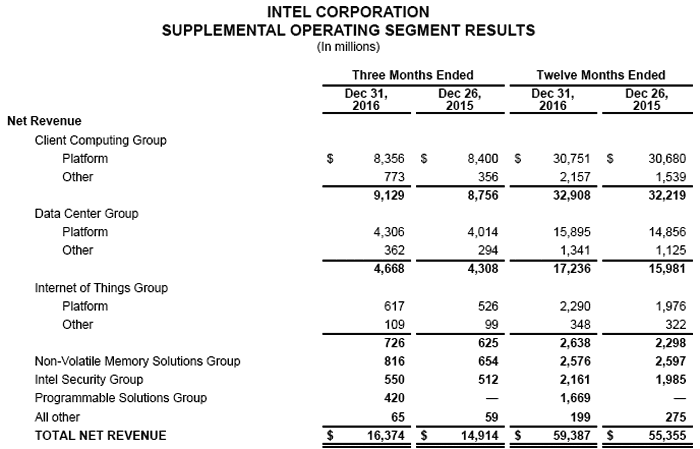 You can see the actual numbers tabulated below, but summing up in prose Intel CEO, Brian Krzanich, said "The fourth quarter was a terrific finish to a record-setting and transformative year for Intel. In 2016, we took important steps to accelerate our strategy and refocus our resources while also launching exciting new products, successfully integrating Altera, and investing in growth opportunities." Krzanich added that he was confident in the future of Intel. The 'Client Computing' business, which is likely of most interest to HEXUS readers, as it includes Intel CPUs for PCs, enjoyed revenue increases both quarter-on-quarter and year-on-year. Our favourite segment really is a cash cow for Intel bringing in nearly $33 billion during 2016. However, in terms of growth it is very much in the shade compared to Intel business operations concerned with Data Centres, IoT, and Non-Volatile memory. As VentureBeat reports, it's interesting to compare the recently published results of Microsoft and Google (Alphabet). 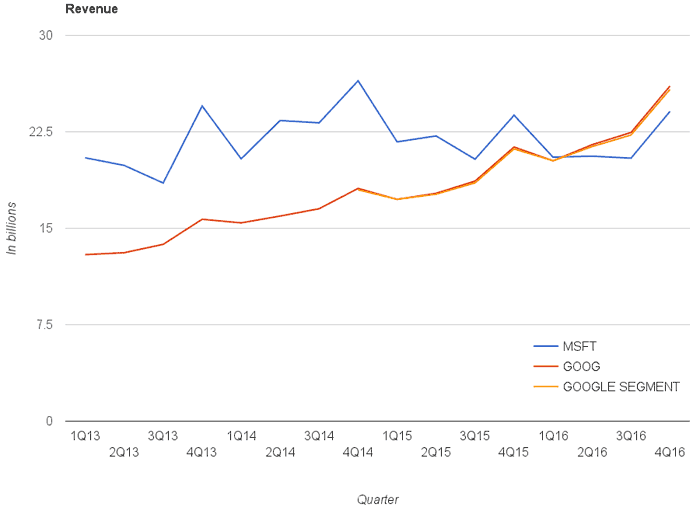 For the last three consecutive quarters Google has managed to stay a little ahead of Microsoft in terms of headline revenue - VB reckons the relative positioning is now a trend rather than an aberration. Microsoft's FY17 Q2 financials can be read through on its Investor Relations site. Highlights in the most recent quarter were revenue was $24.1 billion and a net income of $5.2 billion. CEO Satya Nadella said "Accelerating advancements in AI across our platforms and services will provide further opportunity to drive growth in the Microsoft Cloud." So yes, he banged on about the cloud again. The Microsoft operations HEXUS readers are most interested in, namely the 'More Personal Computing' business, was impacted badly by phone, foreign currency movements, and Xbox consoles. Check the highlights slide above for further details. Google's headline results for the quarter ending 31st Dec 2016 showed revenue of $26 billion, and a net income of $6.6 billion. Both the figures are over 20 per cent better than figures from a year ago. Ruth Porat, CFO of Alphabet, explained that the revenue performance "was led by mobile search and YouTube." Porat added that looking forward Google has good momentum in newer investment areas and "ongoing strong progress in Other Bets" (like self-driving cars). Among the sea of positive numbers in the Google results it was hard to find a negative. However, as noted by The Independent, shares in Alphabet fell in afterhours trading as the results simply weren't as good as investors had expected. The root cause of the upset was a one-off, but significant, extra tax payment. Turtle Beach is buying Roccat for $19.2 million Nvidia to acquire Mellanox for US$6.9bn PC Specialist Vortex S1 Microsoft intros slimmer and lighter modular Surface Hub 2S Has Samsung been chosen for Intel Xe GPU manufacturing?